Discussion Cameron custom shop capabilities? What will they do to a circle t putter? They won't beach it. The only thing they'll do is what's offered on their website...sight line, sight dot, intials and custom shop stamps. send it to tom slighter, he'll do pretty much anything you can think up. I don't think I would send a Circle T putter to Tom because it would decrease value. Alteration work done outside the studio. Call or email is your best bet for the absolute answer. Its weird because you hear different stories. Don't know of its who you talk to, time of day, etc. You can get different answers from them. 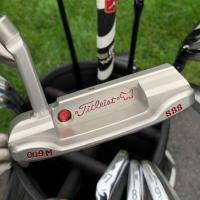 Slighter will indeed do what you want, and probably make a pretty good job of it, but the putter's value will be seriously damaged and it will never get a COA thereafter. I think this should be avoided unless there is something you reallllllllly want badly done and you will keep it forever. They will not do anything to the putter outside of what is offered on the site except adjust lie to spec and length to spec. They'll paint-fill in most any color. What is the Scotty Cameron Dog? And I doubt he puts this on the putter if you want? Thanks for all the input. I can always count on golfwrx for answers. I think e-mailing might get me somewhere! I will let you guys know? It sometimes pays to be optomistic. It won't get you anywhere. The people who get different answers have hookups. Like many others have said they only do what they say on the website. Unless you know someone in the studio or one of the distributors personally you will have to settle for those options.